Ride leader and tour guide Eric Romney is a native of Portland, Or. USA. Eric eats, sleeps and breaths cycling. He has worked as a product developer for the cycling and action sports industry for over ten years and has been touring, racing and riding his bike for over 29 years. 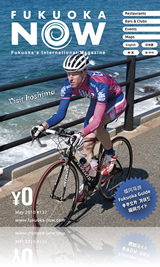 Having spending over 20 years racing in Oregon and six years racing in Los Angeles, he relocated to Japan eight years ago. He speaks the language, understands the culture and can truly offer a unique cycling experience.